My reasoning for choosing these posts as a focal point is because they seem to be a rarity. I mean who thinks about Weed in Japan? Or who isn’t too sidetracked by their excitement for visiting Japan to stop and think about “Hang on, what SHOULDN’T I be doing/seeing/visiting?” And likewise, What was disappointing about Japan? These types of posts were exactly what I was searching for, to uncover the less known facts about Japan and find out what people really think, besides the popular opinions. This is what I really believe is the true use for the representation of Japan on Reddit – To give information for those interested and not just interested in hearing the stock standard opinions. From reading through ‘what NOT to do in Japan? where NOT to go in Japan?’ I was able to find some things that most would not know. The not talking on trains point really struck me as weird, especially from being on Sydney trains where even the ‘quiet carriage’ still has that guy talking on his phone or that baby who just.Won’t.Stop.Crying. In addition I have found what seems to be a typical Westernised tradition “The Tokyo Yamanote Halloween Train” Where a bunch of tourists dress up in halloween costumes and get drunk and cause a ruckus on two Japanese Peak Hour Trains. The views on this seem to be incredibly negative and from viewing a few of these videos it’s obvious that the people participating in these train rides are showing no respect for the ‘Quiet Train’ rules or the Japanese people in general. Something that has never occurred to me is to question the laws regarding Marijuana in foreign countries, besides the obvious – Bali. Well ‘Weed in Japan’ definitely answered that for me. I had always thought that the general consensus was the same as that of Australia, that it’s illegal, but more frowned upon rather than a serious crime. As the picture above shows, that is NOT the case in Japan, the entire post contains people warning against it – although is seems harder drugs are more common with less penalties. The final post I found to be incredibly interesting was the ‘What has disappointed you? (regarding Japan)’. Which contained useful information about aspects of Japan which weren’t what the author thought they would be. Things like the medical system being terrible or that toilets are apparently the most technologically advanced part of Japan? So my transition from the beginning of this sub-reddit to finally finding relevant and unique information was tough at first but in the end I managed to get on a pretty good role and spent about 5 hours on just this sub-reddit (I was in deep guys), but this is exactly what I wanted to get out of it. To see the lesser known side of Japan and how it’s represented in an online community. As defined by Ellis et al “Auto-Enthography is is an approach to research and writing that seeks to describe and systematically analyze personal experience in order to understand cultural experience’ (2011). I will be applying this to the representation of Japanese culture as a whole on reddit (mentioned in previous blogs). As I haven’t been to Japan (yet) to experience this, I will be attempting to submerge myself in the online communities of reddit to enable me to gain a full understanding of why these sub-reddits exisit, who is using them and what I can learn. The personal experiences I will be drawing on will be my perusing of these Sub-reddits which will help me to “study a culture’s relational practices, common values and beliefs, and shared experiences for the purpose of helping insiders (cultural members) and outsiders (cultural strangers) better understand the culture (Maso, 2001). I believe that as reddit is a forum with a HUGE traffic flow (Average of 16 Million per month) it will be the perfect place to complete my auto-ethnographic study. I will be focusing on 3 main subreddits /r/japan, /r/japanlife and /r/japansports. In the following weeks I will be analysing each of these sub-reddits in more detail in order to better utilise some of the “showing” and “telling” techniques in which Ellis et all mentions (2011). I feel like the main barrier for the study will be where exactly to start and what information will be relevant. Though this should be overcome by simply spending time on these particular subreddits, making use of screenshots and putting together a Prezi with my findings in a mind map sort of layout. Maso, Ilja (2001). Phenomenology and ethnography. In Paul Atkinson, Amanda Coffey, Sara Delamont, John Lofland & Lyn Lofland (Eds. ), Handbook of ethnography (pp.136-144). Thousand Oaks, CA: Sage. So after the tutorial last week and briefly discussing my ideas with Chris, I am happy to announce I finally have a topic! Reddit. Whilst I have a feeling that others are doing Reddit, I will be focusing on Japanese culture as a whole on Reddit. While this may seem like a sort of whimsy topic, I believe it it the perfect starting point and will help me delve into the sort of lesser known sub reddits out there. Throughout the course of this research i aim to look in to areas that you normally wouldn’t find or go looking for. While there is Anime, Gameshows, Manga, J-POP, J-Rock etc. What about Japanese News? Sports? or life in general. The aim here is to gain a more well rounded perspective of how the more every day parts of Japanese culture is represented online and also what prompts these areas to make an appearance online. Whilst looking around through some of these reddits, I’ve found out some fun facts about Japan like; The average cost to repair a car that has hit a deer. Answer; about 425 000 Yen. Or, the Japan Airlines will start serving KFC on flights to Tokyo. Who would have thought the Japanese were so fond of some fried Chicken? These are the facts Im tyring to discover, and again, what is prompting people to post these things. As you can see from the image to the right, there is also seems to be a large non-Japanese presence in these sub-reddits. Hopefully by the end of this course I will be able to answer this. Castle. As with all Japanese celebrities – especially those on game shows, they really become the character they are acting. 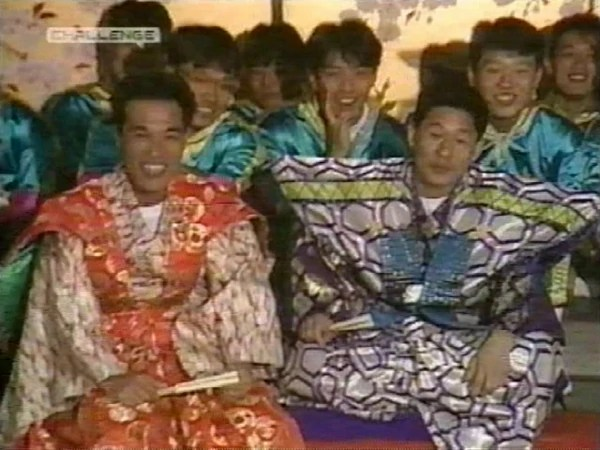 Whilst Takeshi’s Castle was a small part of Takeshi’s career (only spanning 3 years ‘86 – ‘89). He is also an established director, actor and owns a talent agency and has won numerous awards for his work. Takeshi is well respected and has amassed a large following of loyal fans. Whilst I couldn’t find much information out about the specifics his personal life, I managed to find a great deal out about his works and the recognition he has received, not just on a Japanese stage. He has been awarded a Lifetime Achievement Award in Moscow and was name a Commander of the Order of the Arts and Letters of France. What I really found interesting about Takeshi and his work was the way he commits to each roll. Some of Takeshi’s earlier films are dramas about Yakuza gangsters or the police. Many of his films express a bleak or nihilistic philosophy, but they are also filled with humor and affection for their characters. Takeshi’s films leave paradoxical impressions and can seem controversial. The Japanese public knows him primarily as a TV host and comedian. I believe this method of filming complemented his acting style which contributed to his success. I think the best way to communicate the diversity of Takeshi Kitano is by simply showing him in two completely different roles. So I started watching anime back when was around 16. My friend was near obsessed so i just had to see what all the fuss was about. Since then I have watched many different Anime and they all share the same core principles. They keep you wanting more. The story telling in anime and the visual design is so well done and in depth that it does really create the atmosphere and emotion the creators are trying to portray. I think my first introduction to anime was Death Note (it was at least one of the first). It just captured me. The story of a bored student descending into madness fueled by his own personal righteousness. This story kept me on the edge of my seat, and still does when I rewatch it. Anime is a very detailed art form, it differs from western animations by focusing on fewer, more detailed still frames which are aimed at creating a sense of realism. it also utilizes camera angles and techniques to increase suspense and tension which is being portrayed throughout the story. I believe that it is these factors that make anime so popular with adult audiences, not just children. One of the more recent Anime have watched recently, Sword Art Online. I think the major reason I enjoyed this – apart from it just being awesome – is that it is relatable with the basis for the story being about an MMORPG. Having spent many years playing this genre of games I really like the way it has been represented in this media. Add in some virtual reality and a sociopathic Game Master who states, once you enter the game, if you die in game, or the virtual reality helmet is removed, you die in real life. I think this was a clever jape at the seriousness of some MMORPG players crossed with the deep immersive nature of Anime. Again, this Anime portrays its story through the highly detailed still artwork and tension building moments. I think Anime is a brilliant form of digital media and look forward to see it progressing further and spreading into the west more. I’m Trent and I’m in my last year of an Information Technology degree. This is my 2nd DIGC class so Im getting a little more familiar with the content and style. I don’t really know what to expect with this subject but from what I’ve seen I think it is going to be a pretty cool subject to study. I have played a few JRPGs through the likes of Zelda and of course Pokemon (the usual it seems). In terms of more westernised JRPGs I have played Neverwinter Nights, Dark Souls and Balder’s Gate. I find that a lot of my gaming preferences come from the Japanese styled game play. I prefer intense story and RPG style – whilst not hugely showing their Japanese roots anymore, the fundamentals are still present. When it comes to anime I have watched a few shows and whilst I would by no means call myself knowledgeable on the subject, I really enjoy the horror/gory and suspense side of anime, shows like Elfenlied, Ghost in the Shell, Highschool of the Dead , Death Note and Sword Art Online etc. I really admire the level of detail in the development of the story that the creators show. I find that whilst I am more of a part time viewer of anime and Japanese media culture, it still appeals to me in a variety of ways. I look forward to learning more about the history and culture as the subject progresses.